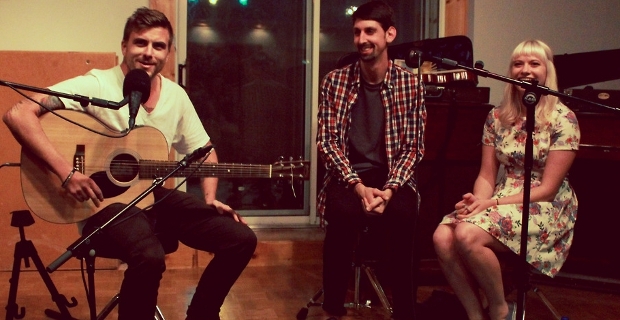 Under the Gun Review was able to send staff writer Dan Bogosian to Will Yip’s Studio 4 in Conshohocken, Pennsylvania to review the second ever Studio 4 Session with Anthony Green and Tigers Jaw. When Will Yip first announced the Studio 4 Sessions, I wasn’t quite sure what to make of it. On one hand, Will Yip is a wonderful producer with a solid background ranging from everything like the experimental side of Circa Survive to the straight forward pop punk of Man Overboard, engineering things ranging from Lauryn Hill (really) to Koji. With that sort of diversity, the launch of his own studio through a crowdfunded campaign to keep studio prices down and acquire everything he needed made total sense, but what would a live session be like? Throw seventy some-odd people into a large room best served for recording drums underneath a bar just outside of Philadelphia and watch two of today’s greatest artists perform acoustic sets, and you have the Studio 4 Sessions. I went to the second date, in a sense seeing Tigers Jaw’s most recent performance, this time as a duo of Briana and Ben. Performing both new songs from the unreleased full length they have recorded and classics from their debut, the room sounded perfect for a stripped down session, with the acoustics and spacing of the large hall a great match for a quiet get-together. After Tigers Jaw did a solid performance, a fifteen minute interval displaced Anthony Green’s appearance, which immediately had Ben and Brianna come back out. The Tigers Jaw singers performed harmonies on one of Green’s solo songs, kicking off an interesting set for the singer. Green usually performs with a backing band, even in an acoustic setting (Good Old War, anyone? ), but this was a full-on one man show beyond the harmonies on the first song. Anthony literally ended up taking a request from the crowd, but not during the show; with such a small environment, a fan approached him before the show started about how he hadn’t heard a certain song off Avalon live before, and half way through the set, Anthony obliged to play it, but added in the comment that if he screwed up the words, it’s “not [my] fault.” Towards the end, Green started a strong run of songs with “Tempest” by Deftones; a solo acoustic rendition of a monstrously heavy Deftones song I had never heard before was one moment I’ll never forget. Concluding the set with his original “James,” the set was full of highlights for any Green fan. Perhaps more powerful than any particular song, however, was when Green pointed out how rare this moment was. Green thanked everyone for their attention and the quiet, saying at a packed rock show, the noise and sing-alongs were a sign of love and respect, but at an intimate recording studio, where an artist who could sell out a room of a thousand plays to only seventy or eighty people, sincere silent appreciation was the best sign of utmost respect. Green encouraged everyone to hang out after and to talk to him if they wanted. Both Anthony Green and Tigers Jaw obliged any fans who came up after, taking photos and talking about anything with anyone who wanted. Will Yip made his way around, shaking hands with all who stayed. I’ve been to other recording studios before, but I’ve never seen one try to turn a room usually reserved for musicians paying top dollar to record in into a community of artists supporting each other. With a sign-up sheet on the way out for an e-mail list for any further Studio 4 Sessions, I put my name and e-mail down. The compilation he put out has a wide array of artists, and if this session was just the beginning, I sincerely hope I have the chance to return.